My mom was an actress, so I grew up in a show biz household. I majored in drama in college, and I started my adult life as a professional actor and composer/lyricist before switching to my other great love, writing mystery novels. It won’t surprise you to learn that, when it comes to musical theater, the two most revered names in my house are Richard Rodgers and Stephen Sondheim. Rodgers’s TWO BY TWO was the second Broadway show I ever saw (I was 15), and three years later I saw Sondheim’s A LITTLE NIGHT MUSIC. I ended up sitting through ALNM a grand total of five times (I’m a bit of a Sondheim freak, and that show is by far my favorite of his works). I’ve seen every major show Richard Rodgers and Stephen Sondheim ever wrote, with one great exception. That would be their one and only collaboration, DO I HEAR A WALTZ? I grew up listening to the original cast album of this 1965 musical, but I’ve never seen it onstage until now. I was familiar with the story–it’s based on Arthur Laurents’s 1952 play, THE TIME OF THE CUCKOO, which starred Shirley Booth. It was filmed by David Lean in 1955 as SUMMERTIME with Katharine Hepburn and Rossano Brazzi (I own the DVD). The plot is simple: A lonely American secretary saves up for a dream vacation in Venice, where she hopes to find romance. She does–but not the kind she wants. She has an affair with a married Venetian shopkeeper that ends in a bittersweet goodbye when she returns to the real world, sadder but presumably wiser. Encores! at City Center here in NYC is dedicated to presenting semi-staged concert productions of lost or forgotten Broadway musicals, and this season they included DIHAW?, which ran for 220 performances in 1965 after what were politely called “mixed reviews.” There have only been three major professional revivals since then, none of them in New York, so this was a chance to see the rare bird on its feet, as it were. 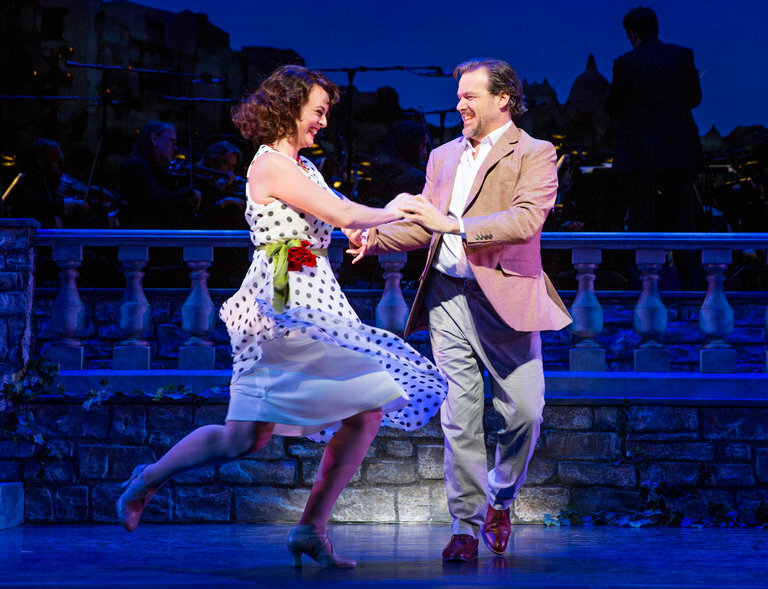 It was well-staged by Evan Cabnet, with a B’way-caliber cast and full 31-piece orchestra. (The orchestra alone is a good reason to have seen this.) Melissa Errico and Richard Troxell played the leads, and they both sing beautifully (he’s a Met tenor). 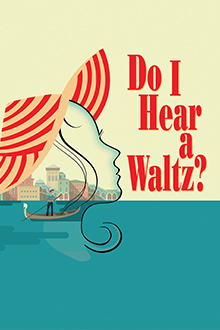 So, after all that, what do I think of DO I HEAR A WALTZ? Hmm. It’s okay, I guess, but hardly scintillating. Rodgers and Sondheim famously had trouble working together–not a surprise, considering their wildly divergent styles of songwriting. The original show almost didn’t happen, so frosty was their relationship. 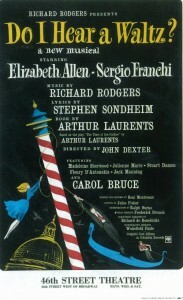 Still, they managed to produce an interesting score that contains several gems worthy of inclusion among their best work: the haunting trio, “Moon In My Window,” sung by the three principal women; the leading man’s powerhouse ballad, “Take the Moment,” that ends Act One; and the effervescent title song, beautifully performed by Ms. Errico and the cast. The lilting score notwithstanding, there’s something oddly unmusical about the whole enterprise. What worked in the original play and the Hepburn movie (gorgeously filmed in Venice!!!) doesn’t seem to translate well to song and dance. The two lead characters have been altered from the original, and not for the better. The leading lady, Leona Samish, is now–how shall I put this?–not a very nice person. She’s prickly, opinionated, and Puritanical. And her paramour, the married Italian fellow, now comes off as a standard-issue roué and opportunist who is cheating on his wife (and kids) with a woman he doesn’t really love. Unlike the original play and the film, the man in the musical is remarkably insensitive–he browbeats the poor woman into bed despite her misgivings. Later, when she questions his sincerity, he accuses her of ruining everything with her rigid morality and ends the affair. (This ugly change in tone is all the more puzzling because Arthur Laurents himself wrote the book for the musical.) Most of the other principal characters are similarly conflicted and/or compromised, emotionally and morally. It’s a very gray area, morality-wise, and not particularly pleasant. So why the hell is everyone singing and dancing? There’s no satisfactory answer to that question. In conclusion, I’m glad I finally saw the one collaboration of my two favorite musical theater writers, but I can’t say the show they created is among my favorites. If I were to blame anyone for that, I’d blame Arthur Laurents–he didn’t seem to trust his own original material, “updating” it and reducing it to a squalid affair between an overbearing horndog and a strident fool. I’ll stick to listening to the original cast album–that, at least, is an undiluted pleasure. And I’ll continue to enjoy the David Lean movie because Hepburn and Brazzi made the difficult central characters both charming and poignant. Unfortunately, charm and poignancy are the main things missing from the musical version. This entry was posted in Personal, Uncategorized by Tom Savage. Bookmark the permalink.